such as Shell, BP, Rio Tinto, PG&E, Georgia Pacific, and Freeport McMoRan. What can we do for you? When you have ongoing corrosion of concrete, that can cause loss of structural integrity, or structural failure. You likely have limited time to research and source solutions, or organize and lead repair efforts. So nothing is resolved and the existing problems get worse as new ones arise. HJ3 is a single-source vendor that will take you from beginning engineering through to a completed installation. We have engineers, estimators, project managers and certified installers to tailor solutions for you. We have the resources to solve your structural problems, no matter the size or complexity. CarbonSeal™ protects from future corrosion and returns structural integrity. 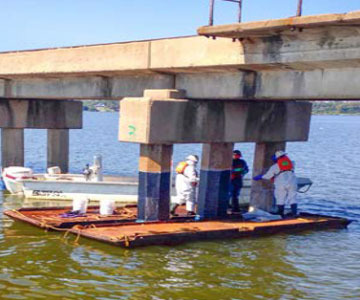 This bridge had 93 piles and 2 trusses that needed repair, strengthening and protection from brackish water. 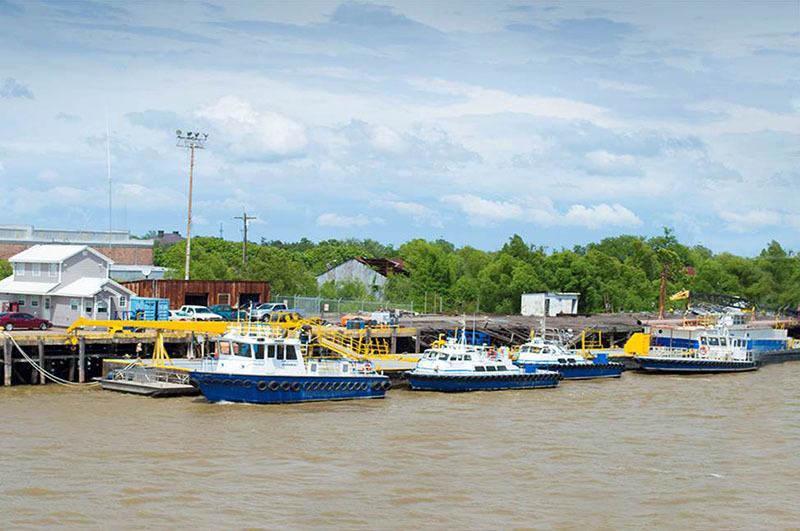 The piles needed repair extended 10 feet above and 5 feet below the waterline. 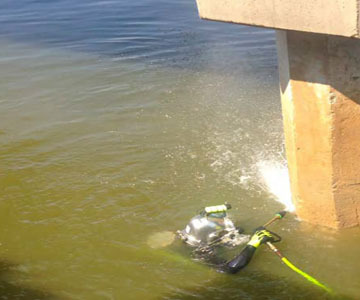 HJ3 had an above and below water team of certified installers. 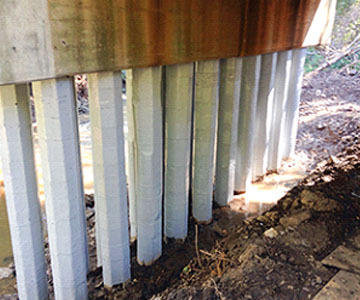 A bridge with deteriorating concrete on 93 each reinforced concrete piles and 2 each reinforced RCT (Reinforced Concrete Truss) spans in a bridge outside of Texas. The bridge had cracked and spalling concrete with exposed rebar. 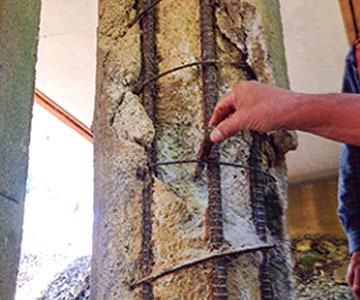 The columns were demoed, steel repaired or replaced and the columns formed for the concrete pour. The surface was prepped by grinding to create a profile and remove lattence concrete. HJ3’s CFRP system was then applied over the cured concrete. A chemical resistant topcoat was then applied and then a UV resistant topcoat applied over the entire repair. 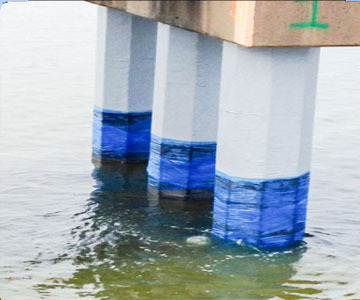 The CarbonSeal™ repair restored the strength of the piles and trusses above and below the water. The repair has extended the life of the bridge by about 20 years. 20 bridge piles had extensive cracking & spalling. Lateral ties lost 40% to 80% of its steel cross section due to corrosion. CarbonSeal™ unidirectional wrap replaces the strength lost from the corroded lateral ties. System coated with a permeation resistant coating. Job completed in 2 weeks saving the client 70% of the time and cost of replacement. 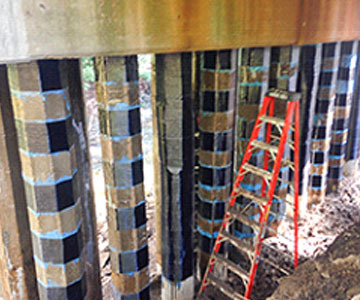 See more Bridge Pilings case studies here. HJ3 has staff engineers and a forensic engineer who can evaluate structural issues and identify future problems before they arise, helping you manage risks effectively. Even if the solution doesn’t result in using our products, we will give you an honest, accurate evaluation with recommended remedies. Contact HJ3 at 877-303-0453 or fill out the form and let’s talk about your project.